Virginia driver improvement is a DMV approved 8-hour course that is completed on the Internet. Most Virginia drivers who must take this course have accumulated too many traffic tickets or a Virginia court has ordered their attendance. Virginia law also allows drivers to attend the course voluntarily to receive up to five (5) safe driver points on their license. These points can be used to offset points from a traffic ticket received at a future date, but they cannot be used to remove points from an existing ticket. Please read the Virginia Driver Improvement FAQ for additional information, or contact us if you have questions about the course that aren't answered on our web site. At least 20 years old – You must be 20 years of age or older to take this course online. 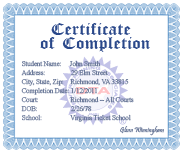 If you are under 20 years of age and you need to complete a Virginia driver improvement clinic, you must take the course in a classroom setting. This is Virginia state law. You can click here to locate a Virginia classroom driver improvement clinic in your area. Not CDL holder – If you hold a Virginia commercial driver license (CDL) and you need to attend a driver improvement clinic, you may not take an online course. This is a Virginia state law. You must attend a Virginia commercial motor vehicle (CMV) course in the classroom. You can click here to locate a Virginia CMV clinic in your area. Out of state drivers – Out of state drivers should be aware that if they receive a traffic ticket in Virginia, they can take the 8-hour driver improvement course online as long as they are at least 20 years old and not a CDL holder. The online course requires approximately eight (8) hours to complete based on an average reading speed. Slower readers might require more time to complete the course, but there is no minimum time – you can take as long as you need. The course contains video segments such as simulated crashes that demonstrate how a driver should use IPDE and other defensive driving strategies to avoid a collision. While many topics are presented in a textual format, our course contains more video than other Virginia driver improvement programs. After you complete the course units, you will be required to pass a final exam. The final exam contains 50 questions as required by the DMV, and is based on the material you studied during the course. The final exam has a very high pass rate, but if you do not pass on your first attempt, you must wait 24 hours before you can attempt it again. After you pass the final exam, we will report your completion electronically to the Virginia DMV. We will also print your certificate of completion and mail it to you. If you have been court ordered to attend this course, you should make a copy of your certificate and mail or hand deliver the original to the court. We do not report completions to Virginia courts; it is your responsibility to ensure that the court receives the necessary paperwork from you. If you need your certificate quickly, you can call us at 1-800-222-9199 to request express delivery. To have your certificate sent out the same day you are requesting this service, you should call our office by 3:00 PM. Ready to get started with your online Virginia driver improvement class? Click the register button to begin.